Though not rare, wood thrushes (Hylocichla mustelina) are special visitors in Manhattan. I have had three sightings: May 11, 2013, Nov. 14, 2014, and April 23, 2017. In 2013, there were two wood thrushes singing, a glorious sound to hear in the Ramble in Central Park. In 2014, the wood thrush was hanging out in small planted areas surrounding a corporate building at 49th Street and Sixth Avenue. The 2017 visitor was foraging in the leaves between Humming Tombstone and Tupelo in the Ramble. The Filming the Feathers video is set to a flute sonata by Carl Philipp Emanuel Bach. Although I have heard wood thrushes sing their gorgeous song, I haven't been able to record it. You can listen to the thrush by clicking on the Cornell link above or the Audubon field guide link. The bird I saw on Sunday was digging around for insects and flipping up leaves in the Ramble, doing what wood thrushes like to do, but unfortunately not in good light or in an open area! The little cinnamon-headed guy was opening and shutting his beak, but the song was not the loud song I got to hear in 2013, but much softer. I could barely hear it, and attempts to record the call failed against the sound of a helicopter and parkgoers talking away. 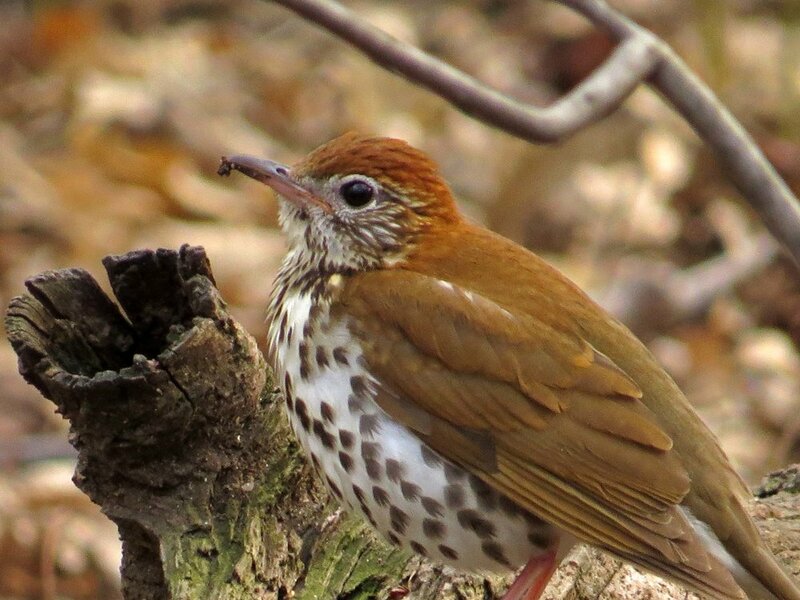 The wood thrush we saw in 2014 was hanging out near the Chase building in Midtown Manhattan, along with a hermit thrush and a brown thrasher, an ovenbird and a yellow-breasted sapsucker and a common yellowthroat. What a great holiday gift these birds were for us that year. I didn't take video in 2013, but did take photos. Although a bit grainy, I offer them here anyway.